The Match Predictor Quiz pot wasn’t won this past weekend so next week the Match Predictor Pot will be £800 and the THREE matches to predict are as follows. PLEASE NOTE: Man Utd are playing Friday night so your predictor entries need to be in by 8pm Friday 25th January. 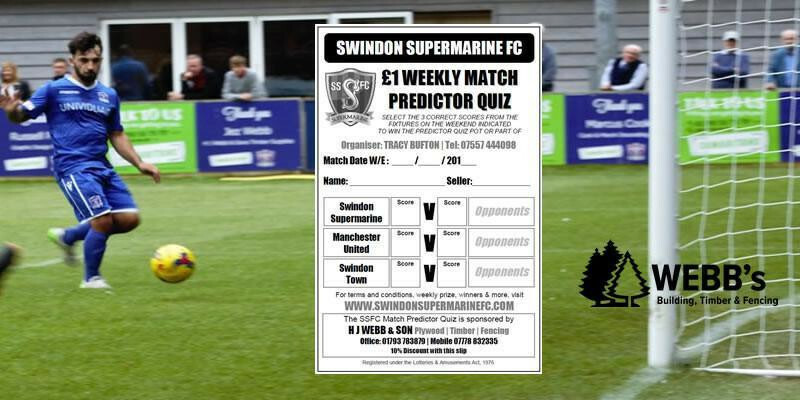 You can enter by buying a ticket from one of our sellers, including staff and players or alternatively download the multi entry Predictor Quiz Sheet below, then enter your scores and attach to an email before returning it to supermarinefc@aol.com. We can then make arrangements for payment afterwards. Click Match Predictor Sheet to download the multi predictor sheet with up to 10 predictions available, its easier than writing out your tickets! Additionally, if you are in a position where you can sell the Match Predictor Quiz tickets each week then please make contact with the club at supermarinefc@aol.com and you will receive 50% commission for every ticket sold over 10.